NASHVILLE – ADELMAN, Dr. Edward Alfred, Sr. - On March 6, 2018, Edward Alfred Adelman joined his loving wife, Margaret Manning Adelman, and his parents, Edward Nickolas Adelman and Alfern Caldwell Porter in the presence of the Lord. He was a wonderful, caring and true husband to Margaret as well as an incredible father to Catherine Adelman Hancock, Edward Alfred Adelman Jr., Francis Manning (Kelly) Adelman, and William Fraser (Lynn) Adelman. He dearly loved his ten grandchildren, William Caldwell (Elizabeth) Hancock, Jr., Robert Adelman Hancock, Thomas Manning Hancock, Mary Catherine Hancock (Taylor) Mitchell, Helen Davis Adelman (Rod) Roudi, Margaret McColl Adelman (Will) Curtiss, Francis Manning Adelman, Jr., Edward Grayson Adelman, Stephanie Lynn Adelman, Margaret Manning Adelman, and his six great grandchildren, Frank Callaway Hancock, Eleanor Adelman Hancock, Emma Bidwell Hancock, James Noble Curtiss, Thomas Wellington Curtiss, and Edward Kellers Mitchell, IV. He was admired greatly by his nieces and nephews, as well as many grand and great-grand nieces and nephews. He served his country in the 82nd Airborne where he earned a Purple Heart and Bronze Star. He graduated from Appalachian State University [Boone, NC] where he was the starting halfback on the football team. He then received his Master’s Degree at Peabody College and went to on to earn his PhD. at Vanderbilt University [both in Nashville, TN]. For over thirty 30 years he was a coach and principal in the Metro Public Schools including White’s Creek, Maplewood and Cohn High Schools [all Nashville, TN]. He was a communicant of St. Henry Catholic Church where he served on the Parish Council. He was a member of the Serra Club and the Knights of Columbus. He took communion weekly to the patients at the Veteran’s Hospital. Visitation will be Sunday, March 11, 2018 from 5-7 PM with rosary recitation at 7 PM at St. Henry Catholic Church. Mass of Resurrection at St. Henry Catholic Church will be conducted at 11AM on Monday, March 12, 2018 with visitation commencing one hour prior to service time. Grandsons will serve as pallbearers. Burial will follow at Harpeth Hills Memory Gardens. Special thanks to the staffs at Mary, Queen of Angels and NHC at The Trace for their loving kindness. In lieu of flowers, please make a donation to Alive Hospice, 1718 Patterson Street, Nashville, TN 37203. [The Tennessean, Nashville, TN, 11 Mar 2018, Sun, Main Edition, Page A19] Edward registered for the draft ca. 1942. 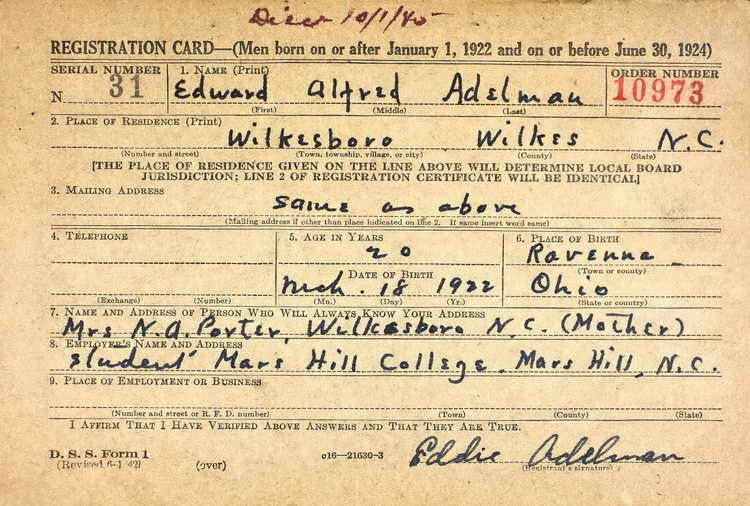 On 27 October 1943, Pvt Adelman was transferred from the Parachute School, For Benning, GA. to Company A, 508th PIR. Pfc Adelman was wounded on 8 June 1944 in Normandy. He was promoted to T/4 on 14 September 1944 and then to Sergeant on 4 January 1945. His military decorations include the Purple Heart with one Oak Leaf Cluster, the Combat Infantryman Badge and the Bronze service arrowhead device, both awarded for participation in the Normandy assault.